For the past several years, my partner Daniel has worked for Gilda’s Club of North Texas. (Although now known as Cancer Support Community, it will always be Gilda’s to me!) Named in memory of Gilda Radner who lost her battle with Ovarian cancer in 1989, Gilda’s Club is a haven for those living with cancer, as well as family and friends of those affected by cancer. Today was a special day at Gilda’s Club– the annual Remembrance Ceremony, where those who have lost loved ones to cancer in the past year come together to remember, honor and share the lives lost. It was a most special time, with amazingly touching music by Resounding Harmony, stories and memories shared by family and friends, and words of comfort from my dear friend and Pastor, Kerry Sumpter Smith. At the end of Kerry’s message, she said, “The memories of those we have lost live on when we tell their stories!” That is why I am sitting here tonight. As friends and family members shared memories at today’s ceremony, I had not planned to speak. Then it hit me that it was early this year that my Denton Creek Elementary Faculty family endured such a big loss with the passing of our dear friend and fellow teacher, Cherryl Sigwing. While I cannot begin to share all of Cherryl’s story, I must share my small part. So I stood and shared a few of my memories of Cherryl. Before I actually met Cherryl, I learned a lot about what would be the basis of my knowledge about her just by walking by her empty classroom. My fourth year in the Coppell ISD found me moving to a different elementary in the district, Pinkerton Elementary. My new classroom was at the end of a VERY long hallway, and the first time walking to my new room I passed the First Grade classrooms. I glanced into all the classrooms, stopping to gaze into Cherryl’s ultra-organized room, then I peered into the room across the hallway. Whoa. Wait a minute. The room across the hallway, that of Jenny Woods, was as close to a mirror image of Cherryl’s classroom as you could possibly get. My first thought: these two teachers must REALLY get along! I had no idea how much! I learned early on that Jenny and Cherryl were a pair of ladies who had their game, teaching First Graders, down to an exact science, and I do mean exact! The names alone, Jenny and Cherryl, one was rarely mentioned with out the other. I must say, I was rather intimidated by them for a few years, always feeling that they were surely thinking what in the world is that guy down there doing in Kindergarten? They were “old school,” I was this renegade-esque guy down the hall doing all this new-fangled stuff they would end up having to correct with the next crop of First Graders I would be sending their way! As the school year progressed, Jenny and Cherryl’s classrooms would carefully and systematically evolve, yet still the mirror image of one another. As I would pass their classrooms, I would sometimes think, “Oh, I wish they would do this or that…,” but it wasn’t too long before this Kindergarten teacher realized he just might have been a bit too big for his britches. Walking by Jenny Woods and Cherryl Sigwing’s classrooms provided much learning for this teacher, as much as their students. I do believe that a valuable lesson I learned from watching these two Master teachers, is “If it isn’t broke, don’t fix it!” Yes, they had their craft down to a science, and their craft worked. For years they honed and tweaked, polished and perfected the art of teaching First Grade. That I were as strong a Kindergarten teacher as Jenny and Cherryl were in First Grade, would be my job well done. The team- Jenny and Cherryl as teachers- was not the greatest gift they had to share with the faculties at Pinkerton and later at Denton Creek Elementaries. The gift they shared in such a constant and shining way was that of friendship. You didn’t have to be around them long to know that they had been friends for a long, long time. Privileged to share lunch with them in the teacher’s lounge for years, it was so heartwarming to always watch them have lunch together. Daily they would share an Arizona iced tea, Cherryl usually splitting it between the two. Dividing an apple or warming soup, then sharing with the other, it was always done without what seemed to be conscious action. It was just what they did. Apparently, lunch was only for starters. It was only over these lunch periods that I learned that Cherryl and Jenny’s families traveled together, attended each others children’s activities, and were as involved with the others family as she was her own. Cherryl and Jenny were more like sisters than friends. Jenny has told me that this was so very true. I dare say they could finish each others sentences, and probably knew the other as well as she knew herself. What a gift their friendship seemed to be to each other! It was only a couple years after their retirement that Cherryl was diagnosed with cancer of the liver. When I heard of Cherryl’s diagnosis, my very first thought was of Jenny. My heart certainly went out to Cherryl’s husband Rick and daughter Lauren, but my heart truly broke for Jenny. In our lives we are lucky to have a few good friends, some of course growing closer than others over time. To have a friendship through the years as close as that between Jenny and Cherryl, truly is a gift of a lifetime. Whenever our close faculty group will get together for lunch, it still seems like Cherryl should be right there, splitting that Arizona iced tea with Jenny. There is so much more to Cherryl’s story than I can begin to share here. What a precious soul she was! The gift she gave to hundreds of First Graders, their families, her fellow teachers, family, friends, and especially to her dear friend, Jenny Woods, is immeasurable beyond words. How blessed I was to teach down the hall from her and gain from her wisdom in teaching young children! “The memories of those lost live on when we tell their stories!” Why don’t you share with someone today the life of someone whose memories you hold? We all will be the richer for the telling! This remembrance is in memory of Cherryl Sigwing and in honor of Jenny Woods. May the knowledge I have gained from each of them continue to make me a better teacher. 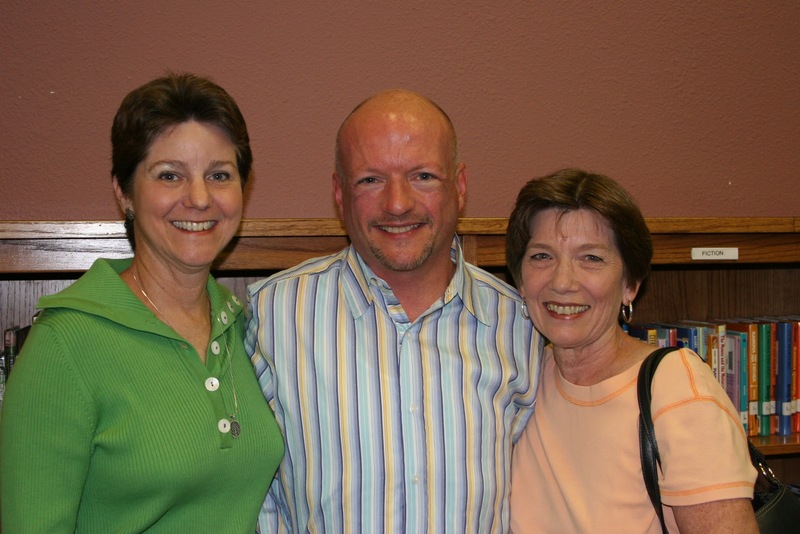 L-R: Cherryl Sigwing, me and Jenny Woods at my going away reception at Denton Creek Elementary, 2005. What a beautiful life experience you graciously shared with us..I knew Cherryl from our daughters playing volleyball together..she and Rick super dedicated parents!